Evoking an immersive photo experience usually entails getting very close to your subject when you actually take the picture; and in the case of large waterfalls, that usually means dealing with a large blast of water spray. Stocking a healthy supply of lint free cloths is pretty much an essential accessory. Maybe even full rain gear might be appropriate. :) Wiping the front of the lens will be a necessity after every shot and longer exposure shots further increase the likelihood of spots showing up on your final image. Sometimes adjusting the angle of the lens or finding another path where the air currents are taking the spray in another direction can help. 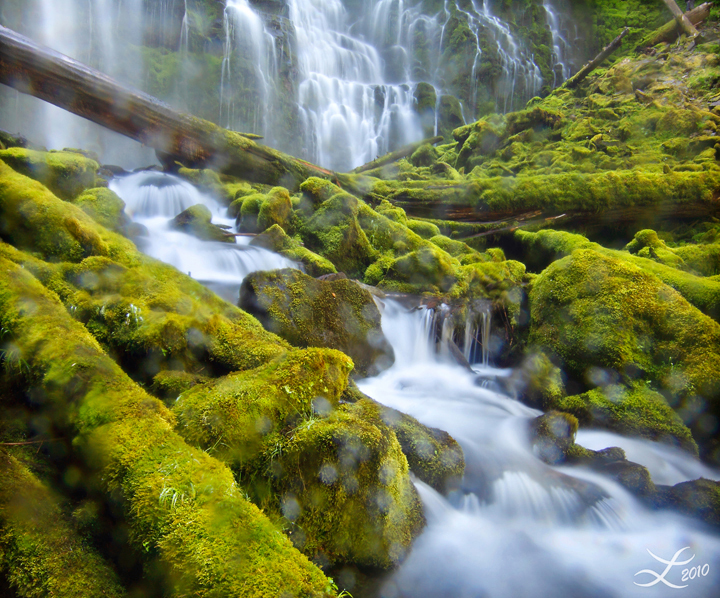 In the case of my shot of Proxy Falls below, I do have quite a few compositions without water droplets, but there is something about showing an extra element of really being there that can add to the overall effect of a photo. In this case, I kept being drawn to a few of my shots that were the most covered in water spray. After all, if you were to really visit that location, it would be part of your experience! My Most 'Interesting' Images on Flickriver. Caveat: Many cameras will run into problems if they are exposed to water spray or rain. I used a Canon 50d for this shot which has a moderate amount of weather protection (sturdier materials, sealing, …) compared to earlier models, and was fortunate that I didn't experience problems this day. I think it is a bit like playing roulette though; two other photographers in our group had fancier cameras (featuring enhanced weather protection) that stopped working due to water issues. Fortunately, once they let their cameras dry completely (I think it took a whole day of air drying), they came back to life. There is a limit somewhere though, and it is definitely a risk to let your gear get drenched. I take at least a plastic bag with me at all times to cover the camera if need be. I am also usually using some kind of attached filter to protect the lens. As a side note: So far, it hasn't been water, but sand that has mangled my gear the most. Between getting in the gears of telescope-type lenses (and messing up my autofocus) or scratching my filters to smithereens, sand has been my biggest environment-related challenge. 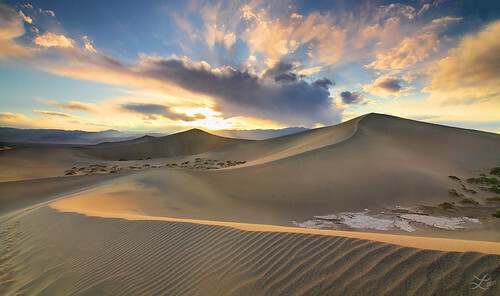 If sand is on your lens or filters, definitely avoid rubbing them or storing them unprotected in a pocket or something. I found dousing the filter in clean water helped get the sand off without scratching. If your filter doesn't have weather sealing though, something like Giottos Rocket Air Blaster might be your safest bet. Cloudy days or shady locations make for beautiful waterfall lighting. A circular polarizer can add even more magic: try turning the filter until the greens are vivid, or the rocks are black. Even without direct sunlight, the subtle water spray from the falls adds thousands of small reflective surfaces that can dull the potential colors in the waterfall scene; it's amazing to see the effect of the circular polarizer in these shots. You might play around with spinning the polarizer through the different angles to see if you like some reflections more than others. And for just about any moving subject in a landscape, I'm a huge fan of the 6-stop ND filter. (I didn't use it here though.) It's fun to see the effect of different shutter speeds on the water. Posted by Laura A Knauth at Sunday, March 31, 2013 No comments so far. Comments Welcome! In support of individual judgment! There is a pressure in modern society to convince people to buy things they do not need or want, but it extends well beyond shopping malls. So many decisions that effect people's lives are deferred to 'experts.' There is usually an intimidation factor to convince people they do not have the necessary knowledge to make a rational decision about the topic, so must defer to a higher authority. It could be someone with a lot of initials after their name, or policies enacted 'for your safety' to protect you from who knows what. Whether well-meaning or otherwise, the result is that people seem to be giving away a portion of their freedoms, and deferring their own judgment to someone else. Say you are a CEO receiving input from your hired team. If you don't engage in active questioning of those reporting to you; if you don't understand the limitations of a person's particular perspective; instead, if you always follow a particular person's recommendation, then who is really in charge? I do not mind paying for my own mistakes; that's part of learning. I mind very much being a passenger and paying for someone else's mistake. It's interesting to consider the only time when it is overtly acceptable to restrict an upstanding citizen's freedoms: parental custody of children. I guess the thought here is that children do not have the experience to make their own decisions, so parents are responsible (and legally accountable) for making those decisions (and enforcing those decisions). I can't help but notice a parallel in the relationship between 'experts' and adults vs parents and children in our modern society. For whatever reason, our society seems to be moving more and more towards a parental control model. Adults are essentially becoming perpetual children in regards to the decisions that effect their lives. The kicker is that people seem to be encouraged to want someone to have that authority (that responsibility) over them. "We worry, so you don't have to." "We've done the analysis for you." How nice, you don't have to think anymore. And it gets better <⁄sarcasm>: When you cede your responsibility to someone else, then you can sue them if they recommended anything outside the approved 'standard of care'. What kind of system is this reinforcing? What motivation do even well meaning authority figures really have for exploring other options? The system is essentially encouraging, by legal ramifications, any deviation from approved standards. Even if the standard of care only has a 2% success rate, it is still the latest and greatest, so will be the one recommended. Once you realize this is going on, then you might ask your doctor the likely success rate of a particular recommendation, and possible side effects (including long term). This can help you decide for yourself whether you are willing to accept the 'standard of care'. If you expect the doctor to make these decisions for you, then you will by default get latest approved standard, even if the success rate is abysmal or has lifelong consequences. I think lawsuits should be reserved for misrepresentation, fraud, or lack of informed consent. Leave the 'standard of care' out of it. If people took back this responsibility for themselves (and did not sue for being burned by hot coffee), then people would essentially have more money in their own pockets. Companies and authority figures would then not be essentially legally obligated to treat you as a child. Lawsuits have run rampant in modern society, and I suspect a significant percent are essentially caused by people deferring individual responsibility to authority figures. Since they, like children, are no longer responsible for making their own decisions, they get to blame the parent when something goes awry. Society pays dearly for this in more ways than one. This parental model for adults is so pervasive. How do you get adults to fall in line as children? A big red flag to me now is fear mongering. In other words, I say fear mongering is a job security scam. Quite a gig: Convince someone they are in dire need of just what you have to offer. Happens all of the time now that I see the pattern. Once I realized that all of the large news stations have been purchased by entertainment companies, I stopped watching the news shows - and I do mean 'shows'. Reporting the live feed from a breaking situation doesn't set one show apart from another, so newscasters babble over highly edited footage to 'create content'. Then they argue about their own created content - drama, drama. Most news shows are selling their invented content, not actually useful, raw information. Give me the live feed, and I will analyze it myself, thank you! Otherwise, it's another example where I'm essentially paying for things I don't need or want. This fear mongering (motivated by power, economics, or otherwise) is creating stress and worry, and causing people to spend their time, energy, and money on invented problems. It's giving someone either money or power, and I've found that's a good way to sanity check things. For example, most magazines make their money not from your subscription fees, but from selling you to their advertisers. It's valuable to know the motivation behind of the information you're getting so you can put that information in proper context. Just notice who is benefiting from any fear-based action you are encouraged to take. I scan headlines to decide if there's something I want to research further. I opt out of airport full body x-ray scans. I suspect long-term safety concerns. I suspect many more unknowns than knowns. Outliers from the standard narrative are excluded. Doesn't mean they don't exist. Researching other points of view about topics you are interested can be very fun! and is a useful sanity check. In my experience, the default standard of care is not always the best. If you need to rely on someone else's authoritative judgment in a pinch, that's fine. But there is a difference between consciously following a path with an understanding of the causes and consequences, and automatically assuming your best option is to follow the expert-approved path. We are trained from childhood to defer responsibility to someone else: parents, teachers, then authority figures, but it is ultimately very freeing once you take back full responsibility. It sounds obvious, but the conditioning runs deep (health, politics, security, …). I am grateful for the opinions of experts, but I am much more conscious now to put them in context before I decide if I'm going to act on any particular opinion. More often then not, I find it helpful to merge multiple options and explore my own ideas. Be the CEO of you own life to reap your own consequences, your own rewards! Posted by Laura A Knauth at Wednesday, March 27, 2013 2 comments so far. Comments Welcome! I went home & looked up an interview with Walton Ford on Art21, he actually described the Hudson River School style of painting (which Thomas Cole started) as inspiration for the backdrop for some of his work. Intriguing coincidence! Thought the rest of his interview was very thought provoking as well, so wanted to pass it along. I am more and more inspired by these aspects of storytelling through imagery. I want to start experimenting with this more myself. It's so encouraging to see some contemporary art that is more than a haphazard mash-up of imagery that I find in most modern exhibits. I mean, to some extent you could frame a picture of anything, or put any object on a pedestal and if you as a viewer are poetic enough, you could interpret something about the nature of the universe. But that defers nearly all interpretation of meaning and significance to the viewer. At that point, people could learn just as much taking a walk anywhere and reflecting on their own surroundings. If something is in a museum and labeled 'art', I do appreciate some level of structure and intent from the perspective of the artist. (Maybe most contemporary 'art' would be better served in some other format, like an essay. The random imagery just doesn't do it for me, anyway.) I found the work from Walton Ford to be a breath of fresh air & hope you find the links worthwhile. Incidentally, this 'Likes' section I started is a bit more complicated then I thought due to copyright concerns for artists within the past 100 years. I just wanted to show a small sample of other people's work & comment on it; but am not sure the proper way to do it. I think (hope) I might be able to take pictures of some books I have for future posts and work it in that way. BTW, for photographers out there, I found it interesting looking at the classic paintings in grayscale to study the underlying structure of the images you find most successful. (You could use a computer to desaturate a color image, or I've been using a handheld B+W viewer either at the museum or my own art books). As George DeWolfe suggested, there definitely seems to be something the classic painters figured out either consciously or intuitively about how to construct their images using a strong understanding of grayscale tones to separate and relate objects to each other. Posted by Laura A Knauth at Tuesday, March 26, 2013 No comments so far. Comments Welcome! I love that macro photography opens up a whole new world to explore without requiring a car or any long travel times or expense. Pure creativity! I actually realized when posting this how much I miss macro photography, which used to be my mainstay back in high school. 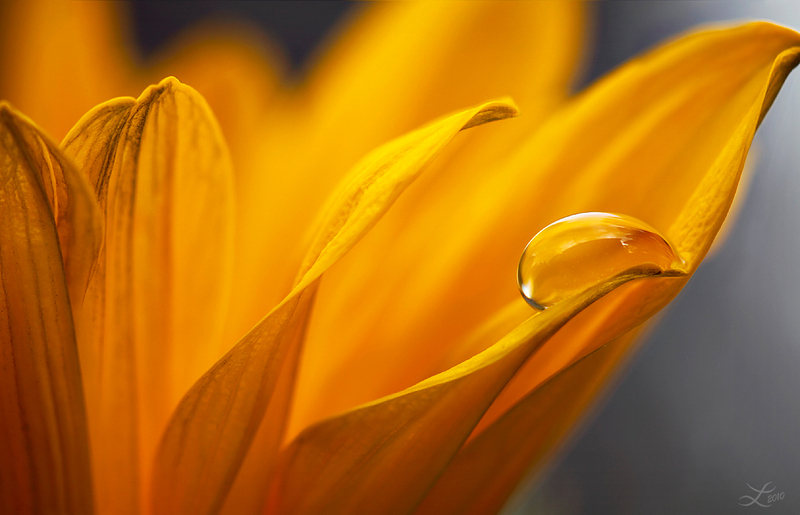 My photo 'Sunflower Petals' was taken with a 100mm macro lens which is essentially a specialized lens (could also be good for portraits), but I carried around a 50mm macro lens for many years which was a great all-purpose alternative. One caveat: 50mm macro lenses (vs a 100mm macro) require you to be much closer to your actual subject, so it might not be ideal for creature photography (bugs, pets, ...). Some wide angle lenses can also work for nice close-ups (my Curve of The Earth photo is one example) and also show the distant scenery. My little point & shoot camera has a macro feature that works well at the widest angle (counter intuitive). You just have to physically get a lot closer to objects then you might be used to with a telephoto lens (we are talking centimeters away), but they do fill the screen and stay in focus. For the photo I'm featuring in this post, the focal plane is very specific (lower/larger aperture), so the background becomes a beautiful blur to highlight the foreground subject. 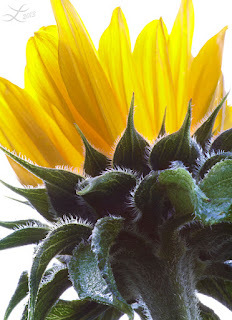 I planted a vegetable garden last year, and this was my first sunflower. :) After the rains stopped, I grabbed my macro & went out to take a few shots. Thanks for looking! Posted by Laura A Knauth at Monday, March 25, 2013 3 comments so far. Comments Welcome! Just a quick anecdote today. When I first moved into my neighborhood, I noticed a broken streetlight. The top fixture was dangling off of the pole. As the weeks went on, I started wondering when 'they' were going to fix it. I wasn't exactly concerned; it was just something I noticed whenever I would pass by and then forget about by the time I made it home. Well, one day (I'm embarrassed to say about eight months later) I finally realized that maybe 'they' didn't realize it was broken. So, I went up to the street light, found a little metal plaque on the front, and wrote down the utility company name along with the 'map' and 'pole' numbers. I looked up the company website and filled out their little maintenance form. When I checked my email the next day, I saw I had a reply just after 6am saying that the company was working through a long list of issues due to a recent storm, but my request was now officially in the system, and thanks very much, and so on. Wouldn't you know it, but when I went home that night, I casually looked up at the problematic streetlight … and it was fixed. Facepalm! All that time and no one in my neighborhood, including me, had bothered to mention the broken streetlight to anyone who could do something about it. I guess I had just assumed that the light would have been in some automated system and that alerted the powers that be when something was amiss. Guess I figured 'they' were deliberately or otherwise ignoring it. Well, turns out 'they' didn't even know it was broken. An interesting lesson that I have applied with decent success in other aspects of my life. Posted by Laura A Knauth at Thursday, March 21, 2013 No comments so far. Comments Welcome! Fun with a fish eye lens! Here's one of my photos showing the possibilities with a wide angle close-up. I love how it combines a macro effect in the context of a broader landscape. 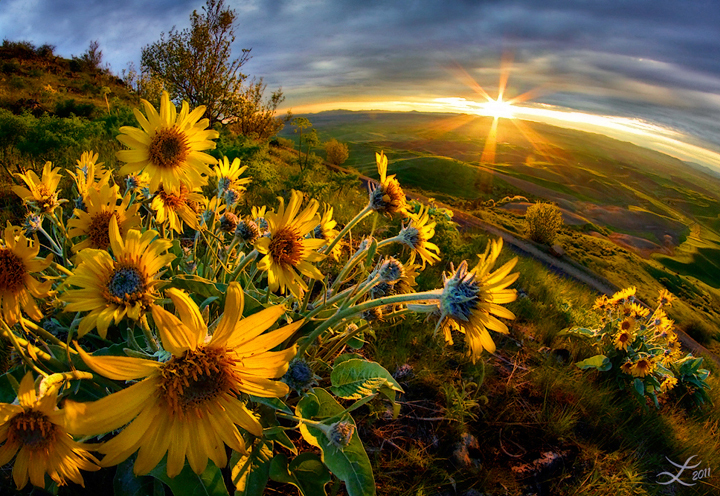 In order to achieve this effect, try putting your wide angle lens unusually close to a foreground subject. (Depending on the lens, you might try taking two photos without moving the camera position: one focused on the foreground, and one for the background to make sure everything is sharp.) Depending on how close you can get, the foreground object will fill a large part of the frame and yet the wide angle view will also show the surrounding landscape. A fish eye lens is just an extreme version of a wide angle lens, and dramatically curves your perspective. In my case, I used an 8mm Fish Eye. (Without a crop sensor camera, I think that is essentially a 180 degree view.) Any lens less than 22mm or so is considered 'wide angle'. The starburst effect around the sun is achieved by setting the aperture fairly small (around f/11 or higher), and then obscuring the light source so it is as small as possible. In this case, the clouds covered the sun enough so a starburst could form (sometimes you might notice this effect with a well-placed branch or leaves, ...). The configuration of elements in the lens determines the number of rays and shape of the starburst. Be careful when shooting into the sun, but playing around with starbrusts can add some fun interest to your photos! Wide angle lenses don't magnify the light as much, so they are safer to start off with, and you can also use your LCD screen instead of the view finder unless you are very sure the sun isn't too bright for your eyes. 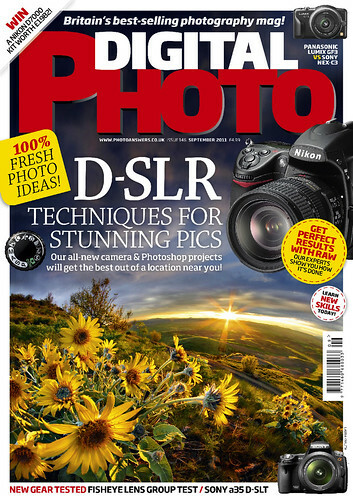 By some miracle, the editors of Digital Photo selected this photo for their cover back in September 2011 . Yay! I saw the issue in Barnes & Noble and bought three copies. ;p What a huge surprise. I'm so grateful. This is certainly encouragement to keep posting. So nice to know an image can still be noticed after the first couple days when all of the main traffic vanishes. Posted by Laura A Knauth at Wednesday, March 20, 2013 No comments so far. Comments Welcome! This is a post for people using Flickr to post photos and interested in some thoughts on the Flickr 'Explore' feature. Flickr ranks the top 500 or so photos per day according to some mysterious algorithm and features these photos on their 'Explore' stream which gets a decent amount of traffic. It's nice to put your photos in front of more people, and getting into Flickr Explore is useful for increasing traffic to your photostream. I am by no means an expert on Flickr Explore, but I have at least noticed some of what disqualifies your photos from being candidates for Flickr Explore. I spent about a year not knowing what I was doing on Flickr and spent hours and hours trying out posting my photos to various groups and their contests, but hardly noticed any traffic on my photos. Even the ones that seemed to do very well in some Group-based competitions still were no where near Explore and I couldn't figure out why. Seems like descriptions, titles, and tags do help. In general, the Explore algorithm seems to be trying to figure out which photos are generating the most enthusiasm per view. How Flickr determines whether your photo is really getting visibility is problematic (not a fair algorithm in my opinion). The 'Less is Better' list above is particularly critical. Use Flickr as a photo school. Check out the Groups where that photo was posted to find Groups you may want to join. Add the photographer to your Contact list and periodically browse the 'Recent Photos' section of your Contact List. Add descriptive tags so people can find your photo much later. Comment and Favorite photos that you like or inspire you. I love seeing more thoughtful comments on my photos, so try to leave more in depth comments for other people's photos I really like. Even though the day after you post your photo, traffic usually falls steeply, if you put lots of tags on your photo, the casual browsers (who might be interested in licensing your photo) will be able to find it and contact you (potentially long after you posted the photo). So, my advice is to use Flickr to keep consistently trying to improve and expand you photo capabilities. Patience and Persistence. Flickr is a valuable training platform if nothing else, where you can compare your work to the other amazing art out there and keep working to add something to the conversation, so to speak. The Scout (Big Huge Labs) website will help show you if any of your photos made it into Flickr explore and any latest trends for these (up or down). If your photo once was in Explore, but got kicked out (likely due to too many groups, or groups with too many members), the Scout website also tracks that info (depending on what options you select). It's a bummer, but at least once you see that is happening, it can help you determine which group you added that might have been 'the last straw'. At least then you can optimize your Group count for future photos. Seems like a lot of traffic is migrating over from Flickr to 500px (which has algorithms of its own). From what I have seen so far, 500px has a way of introducing new photos in front of a lot more people without having to bother with groups. They have categories of 'Fresh', 'Upcoming', or 'Popular' and a concept of 'Flow' instead of just your photostream so you can more easily see what is of interest to people you are following. It's a site I've been trying out this past month and it does have a lot of upsides, so you might find it worth checking out. Flickr Explore is not the end all and be all, but it can help increase the visibility of your photos and give you a greater chance of receiving feedback. When you are starting out, kind words are essentially your currency. I hope these tips help send more your way! Posted by Laura A Knauth at Tuesday, March 19, 2013 4 comments so far. Comments Welcome! Update 3/16/2014: I'm no longer using the strategy discussed in the post below, but am keeping it here for reference. I think it was a good idea until the 'Affordable Health Care Act' kicked in. Here's my latest health insurance strategy. Since health insurance costs are becoming one of the more significant monthly expenditures these days, I thought it was necessary to spend quite a bit of time figuring out how to optimize it for myself. The ultimate goal is to have freedom to spend my time in a way I think is valuable, but that costs a certain amount per month (with Food and Health Care costs being a primary factor). Even with a high deductible health insurance plan, when I was working at a corporate job, my company was paying $350 per month (for a service I was essentially not even using). Prior to offering high deductible plans, my company was paying over $600 per month which is a staggering sum (and much higher for families). Since I have stepped out on my own this year and have a limited amount of time to reach critical mass (ie: income > expenses), getting health-related costs under control has been a top priority. Until recently, I had thought many common health calamities were random, but now strongly suspect our food choices directly effect our health (although it may take 3 months to 3 yrs to notice the effects). I spent quite a bit of time optimizing my food strategy to setup what I think is a high probability plan for eliminating chronic health expenditures (described these strategies in my 'Health' Topic blog posts). The financial intent of all of this is to setup my insurance for catastrophic coverage ONLY. In other words, high deductible insurance policies. I've bought a $10,000 yearly deductible insurance policy from my state Blue Cross, Blue Shield insurance provider. There is an additional $7,000 yearly deductible for a percentage additional costs. It's essentially a $17,000 yearly deductible for $71 per month. Now, $17,000 is a huge expense, and it is intended to cover only acute trauma situations. Needless to say, I hope I never need to use it. Considering that, $71 per month is a hefty fee, but it's what I thought was responsible to do in case my health strategy doesn't work as expected, or in case of disaster. Please do let me know if you are aware of potentially better options! Essentially, all medical costs are out of pocket.A slight upside: I have found though that if you offer to pay for expenses in cash, many medical offices will offer a discount (one was 30% off!). Sounds like medical offices incur major costs of time and expense dealing with insurance companies too. So back to my scenario: that's a difference of $529 per month (normal health care cost: $600 vs high deductible: $71). Running the numbers, I'm essentially betting that I can go for 32 months (about 3 years) saving the difference between premium costs of normal vs high deductible policies and come out ahead. That is, I have the money at the end of that time period instead of the insurance company or medical providers. Increase my odds that I will not need chronic health care costs. For my monthly budget, I've combined food costs and health insurance as my overall monthly 'Health' expenses. In my opinion, I've decided it's a prudent investment to spend a portion of that $529 insurance price difference buying specific higher quality foods and pocketing the rest. I think of financial freedom as a net win of offence (income) vs defense (expenditures). Playing offense is one thing, but the idea here is that you don't have to score as many points if your defense can keep costs to a minimum. I've extended this idea to all other fixed expenses as well, but I've focused on health insurance for this post since it has such a low return on investment (in my opinion). Finding a reasonable way to drastically reduce that $600 a month for health insurance was a huge step to bolster my financial defense strategy. This process has been a key step to setup my attempt at financial freedom. It's all about optimizing resources and probabilities. I'm just a random person describing my strategy, but I hope this info about what I'm trying helps you see what possibilities might be available for you! Posted by Laura A Knauth at Sunday, March 17, 2013 3 comments so far. Comments Welcome! I've decided to add a new Gallery section to my blog where I'll feature my own photography or drawings along with some extra background info. I have been uploading my latest photos to either Flickr or 500px, but thought it would be a good idea to consolidate some of my favorites here as well. And this way, anyone can comment without having to setup a special account. And now, onto the first image! This image is actually a real life sunrise at the Badwater Salt Flats in Death Valley National Park, California. This location is a few miles north of the standard Badwater site (where the formations were inverted at the time). It's been so inspiring visiting sites I have admired for so long from my Flickr heroes. 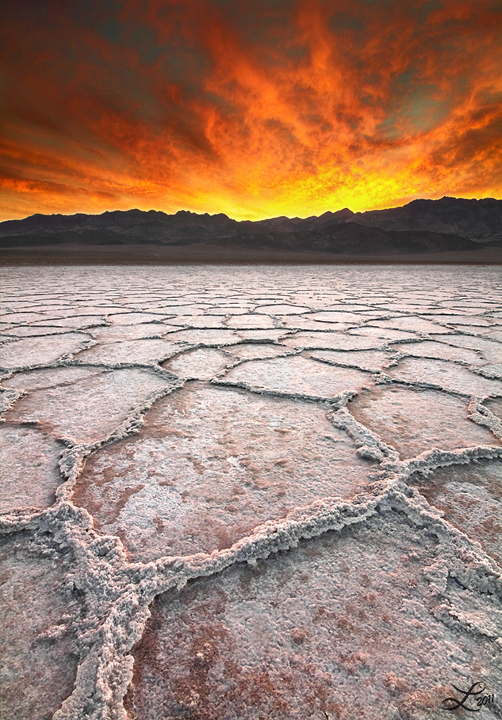 The first time I saw an image of Badwater, I immediately thought of 'fire and ice'. I was hoping to see one of those incredible fiery sunrises for myself, and wow - here it was on the day we all visited Badwater. I didn't expect the vivid yellows too, but there they are. ;p Hope I did the location some justice; it was an amazing experience. Thanks for looking! Posted by Laura A Knauth at Friday, March 15, 2013 No comments so far. Comments Welcome! Thought it would be fun to add a 'Likes' section to highlight random things I think are awesome. 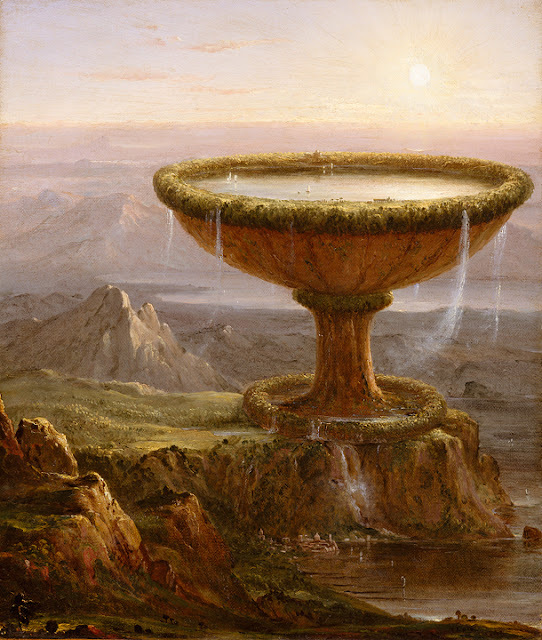 This post features "Titan's Goblet" by Thomas Cole. It is one of my all time favorite paintings. Just an ordinary day in an extraordinary world. There is something about this painting, the child-like wonder expressed with adult skill and maturity that I LOVE. It might even be the theme of (or my hope for) this blog. Other paintings from Thomas Cole are all beautiful and inspired landscapes (shoutout to the Hudson River School), but the serious whimsy on display here is one of a kind. Posted by Laura A Knauth at Thursday, March 14, 2013 No comments so far. Comments Welcome! When someone says an image has been 'photoshopped', it conjures up a bad sense that the original image has been manipulated past all semblance of truth or honesty and is instead some contrived mess of pixels intended to mislead or exaggerate. Indeed, anything useful can also be abused, but I wanted to describe my intended use of Photoshop as a digital darkroom, and my Photoshop philosophy in general. I took photography classes throughout high school where we used a physical darkroom and chemical processing to develop film and prints. I arrived early to prepare the batches of developer and fixer mixtures for the rest of the rest of the class. I was literally up to my elbows in chemicals and thought it was interesting how my watch band would stain my wrist weird and unusual colors. (I cringe at what I must have been exposed to back in the day.) Some of my friends would be so enchanted with the 'magic' of seeing an image appear through the vat of chemicals, but I kept saying over and over again how I wished I could work on the image without the need to go through the finicky, expensive, and toxic process of dealing with all of those chemical baths. The wonders of the digital darkroom were still several years away . . . Using chemical properties, film (negatives) could be developed with certain characteristics (either higher or lower contrast, brightness, …). When making prints, post-processing techniques of burning and dodging effected the specific amount of light that fell on a particular part of the print as you projected an enlarged version of you negative onto the photo paper. Shielding some parts of the print during the exposure would make the printed image appear lighter; blocking all but a particular area of the print would cause that part of the print to become darker then the rest. These were 'local' corrections. So for example, if your negative was too dark in one corner, you could correct that by 'dodging' that corner on the photo paper when you made a print. I remember using cardboard cutouts or waving my hands vigorously through the beams of light to burn and dodge my prints. Now, Photoshop can replace this complicated manual process in the digital age, and I am very glad for it! I am still a work in progress when it comes to Photoshop, and have only really been making solid attempts to understand and translate the effects from a physical darkroom into the digital world in the past year. It is still a slow process, there are so many benefits (and at least I don't have to deal with dust nightmares which sabotaged the majority of my prints in high school, or the toxic exposure from chemical baths). 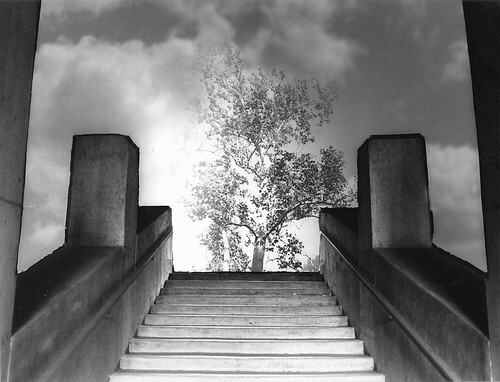 Now images like the composite I made in the darkroom (this one is my favorite experimental composite image I did back in High School) can be done much more cleanly in Photoshop. I think they key is letting people know what they are looking at to avoid misrepresentation (is it journalism, a composite image for artistic effect, a recreation of your experience, …). In this case, the image was a composite of is three separate negatives (I used elaborate cardboard cutouts in the darkroom to merge the images together). Reading the three books from Ansel Adams, describing his photography philosophy really made me appreciate how powerful Photoshop can be to re-create darkroom techniques for a digital age. In his books: The Camera, The Negative, The Print, Ansel Adams talks in depth about these three crucial creative phases that effect the final image. He had very specific intentions about how to use his gear to capture the image, make global corrections to the negative (how many shades of gray in the shadows vs highlights), and what kinds of local corrections to make in the final print. He used chemicals to separate out extra details in the shadows for a particular effect, or drastically increase the contrast of a leaf to give it particular significance and visual weight. It's about working within the limitations of your equipment, to create the result you intended. Basically, I found his books very liberating. I had no idea he spent so much effort and intention changing the characteristics of both the negative and the print compared to what his camera 'saw'. I began to see that it was entirely reasonable to make much more significant changes to my own images using Photoshop than I had thought was 'acceptable' before. I'm not talking about moving mountains around, or cut & pasting in a moon, or swapping people's faces ;p, just simple things like noticing if you eye tends to trail away from off one corner of an image & darkening it a little to keep interest swirling back into the rest of the photo again. These are things I would notice and correct in a physical darkroom, so why not the 'digital' darkroom (aka: Photoshop). Most people assume that they are communicating 'truth' when they point & shoot, and avoiding Photoshop: 'the camera never lies.' But there are still some serious pixel gymnastics going on inside a point & shoot camera (and it is only guessing at the image you were trying to capture). And above all, the camera does not function as a human brain. :p Not even close. 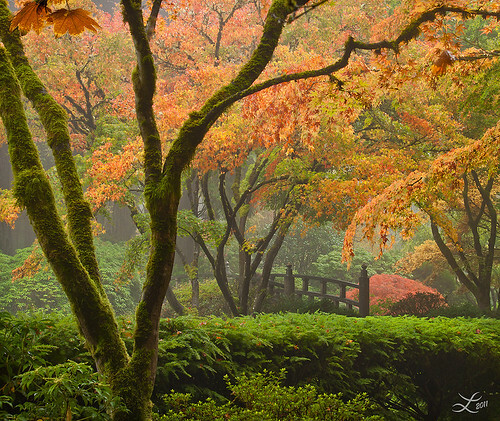 I have been very inspired lately by an article from George DeWolfe on http://www.luminous-landscape.com/index.shtml. The key is that our brain processes the image we see to communicate more information then just raw light values. It interprets relative light values to convey a sense of depth and relationship between objects. This interpretation and relationship between objects is what must be re-created in post-processing; to recover the sense of what it felt like to physically be in that environment. I think most people have an experience of trying to take a picture of a bird, or some small object in a landscape. That bird had seemed so significant to the scene when you took the picture, but looking at the photo, you may find that the bird is so tiny that you barely notice it. There is something important in that disappointment. It was a failure of the camera to translate your experience. The camera did not separate the bird from the landscape as you did in your mind. For one thing, the sharp part of you focus (the fovea) is something like 2% of you overall view, but it occupies the greatest intensity of you interest. The camera records all images in it's focal plane equally. Since our eyes gravitate towards heightened contrast, sharpness, color, extremes, what you might consider trying to resuscitate the image is to slightly blur the other objects, brighten the area around your subject, create a light path from the foreground to your subject (a leading line), … These are a handful of techniques that can attempt to restore intent to your image. Now, these techniques may tweak the 'extraneous' information in your image so that it no longer represents pure photojournalism, fine art photography has an entirely different intent than photojournalism. To some extent, photojournalism is more like non-fiction: a raw datapoint where you are passing forward every detail of the experience without necessarily reflecting on it. In some sense, it is copying information forward for someone else to interpret and act on. This can be incredibly useful, but it's a different intent then most people have when they take a picture. They have a specific purpose! I think it is entirely valid to use photography to communicate an element of the human experience, our own unique perspective. Say you are recording an interview with someone you think has valuable information in a noisy café. So, your tape recorder picks up not only the voice of the person you are interviewing, but the clattering of dishes and an assortment of other bustling activity in the environment around you. Say, sometimes that external noise is so loud that it's difficult to concentrate on what your interviewee is saying. Now, as a historical reference, all of that extra background noise might be of interest to someone, but not necessarily for you who has turned on the tape recorder with the intent to capture and promote the words of the person you think has an incredibly valuable message. Would you be justified in filtering out that background noise, so the main message from you interview is clearly understood? I say yes! If someone wants to record the bustle of activity in a noisy café for posterity, then by all means do so; label it a historical reference. I do not think there is anything wrong with clearly expressing your intent; your idea of what is valuable. Clean up the noise from the interview and then label it accordingly: How to save the world in three easy steps... ;p Whatever it is. To me, filtering out the cafe noise is the same thing as 'Photoshopping' a landscape (vs preserving exactly what the camera recorded in the raw image). Now I'm not saying it's OK to splice together sentences that didn't exist or put words in someone's mouth, (that could be fun as a humorous exercise, but then you'd call it a mash up, a parody, whatever). Photoshop can easily be used for experimental stuff and fantastic creativity can result. It's all a matter of truth in labeling. The gray area is 'photorealistic' images where elements from multiple images are combined, but presented as if they naturally occurred together. Separating tone values in shadows is an entirely different kind of post-processing than adding in a moon or birds flying. (Those two images add such interest to a photo, that they are common candidates for unscrupulous cutting & pasting. Without proper discloser, I think of that crosses the line into an abuse of Photoshop etiquette.) I think photographers mainly need to give people context for what they are seeing; is the image intended as candid photojournalism (raw image dump), fine art (recovery of intent), or experimental/surreal (composite subjects). I don't remember struggling with dynamic range (light/dark limitations) with negative or slide film as much as I do with digital cameras. With slide film; if I included some blue sky in an image, the slide had a beautiful blue sky. The same image with a digital camera will usually have a 'blown out' sky; the sky is brighter than the dynamic range of the camera can handle, so it maxes out at a solid white value. Any cloud effects would be lost; the sky is just a solid mass of white. A similar problem can happen in the shadows which clip on the other end of the range and become a solid black mass. In order to compensate for this, I find I need to shoot multiple images (at least two: one to properly expose the sky information; and one to properly expose the ground), or use a filter (sort of like sunglasses for your lens) to darken one part of the image (usually the sky), so your image has information both in the shadows and the highlights. It's essentially a manual HDR process. This causes me such post-processing nightmares to correct; I have to keep reminding myself of all the other benefits of digital photography vs its chemical counterpart to push through. I keep trying different methods. As I optimize my technique, I'll post the most helpful ones here. Basically, the limitations of digital cameras to capture adequate dynamic range basically necessitates opening Pandora's box of digital post-processing. As automated HDR gets better and better, this should hopefully improve this serious complication from digital photography. I've been experimenting lately with trying to recover the grayscale in images. Essentially, not relying on color to distinguish objects (which is only one of the ways our minds would separate objects in a physical scene). 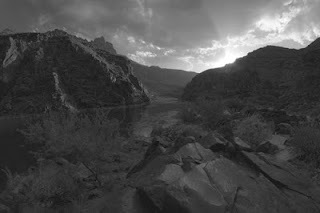 Ansel Adams was known for his handling of grayscale (so many thousands of shades of gray in between pure white and pure black; and relating them cohesively). 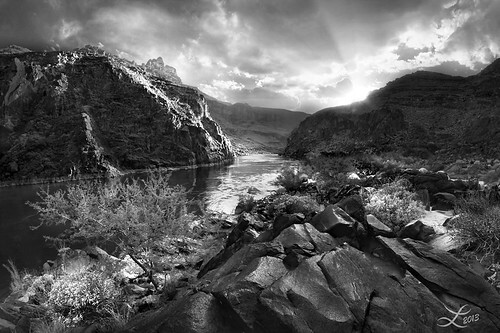 I've been enchanted to see how many famous fine art photos have beautiful grayscale values. (I bought a Tiffen B&W Viewer to look at color paintings in real time and get an idea of their 'grayscale' values; the filter is amber, but you get the idea.) I really think there is something compelling going on here and intend to continue experimenting. I was always curious to know what the images I see from other photographers looked like right out of the camera vs after their post-processing. I thought I would share one of mine to help illustrate my latest interest in focusing on the grayscale and tonal values. I should note that I shoot all of my images in RAW mode with as little camera processing as possible (Camera Neutral color mode). The resulting image will appear relatively flat and dull compared to a JPG you would get from a point and shoot which attempts to correct for the known limitations of cameras (a few of which I touched on earlier). I do this to preserve as much native information as possible so I have more options to work with later in post processing. The first image is a dump from HDR Pro (I combined two images; one exposed for the foreground, and one for the sky). A JPG of this scene would have probably looked a bit better as a starting point than my original, but then I wouldn't have been able to modify it much before seeing strange artifacts. For funsies, here's the color version of the original image. I can assure you this barely resembles the awesome real life view that prompted me to pick up my camera and point it in this direction. After hours of staring at the screen, and trying to re-create the scene I had in mind when I clicked the shutter release (more of the impression of physically being at the location), here's the final image. It is now one of my favorites. I hope seeing the comparison is helpful! "A Powerful Place" Copyright Laura A Knauth, All rights reserved. So basically, the more I understand the limitations of how the camera sees the world compared to how we experience the world, I can appreciate the techniques of painters throughout the ages to capture human perspectives and human intention. It is a concept of using tools and techniques, not being used by them. Studying classic photographers of the past reveals insights to how they went about solving these age old problems, and I am grateful we have new options, including the wonders and pitfalls of Photoshop, to keep evolving in our expression! Posted by Laura A Knauth at Wednesday, March 13, 2013 No comments so far. Comments Welcome! "These are very deep waters"
Authority loves certainty; to be a leader is to confidently declare a direction … even without all of the facts. I can see how it happens. Because when does anyone have the luxury of collecting all the facts? In some sense, you would have to know everything in the universe to be absolutely certain of the right path. So, leaders try to select the most *probable* path to victory (based on experience, intuition … flipping a coin). 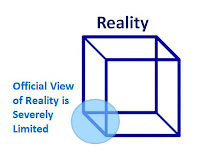 Built into reality seems to be the difficult task of picking a direction without absolute certainty - an icky feeling to be sure, especially when consequences get serious. Unfortunately, I think this simple, innocent, natural state of things has led to some drastically negative repercussions for society in general, and individual autonomy in particular. As people become more and more specialized, the tendency is to refer to 'authority' figures to guide every other aspect of life where you have not specialized. In an idealized sense, it could be a lovely thought: where we all rely on each other to contribute our unique area of specialty to the whole. While I do think the ultimate goal is for people to achieve more together than would be possible individually, the danger is a misrepresentation by 'authority' figures (intentional or otherwise) of the available options. In some sense, the challenge is to gauge how certain you are about a situation versus how certain someone in authority seems to be about a situation. If you forgot you left your keys in the living room, but were told by some authority on finding keys that he checked and they definitely weren't in that room, if you followed that advice, then no matter how hard you looked everywhere else, no matter what expense you might incur hiring more and more people to look for those keys, you would not find what you were looking for. Sometimes you simply need to take another look at ground you thought was already covered. In the past, if I had a bad cold, I went to the doctor and took whatever pill was prescribed. I thought that was the responsible, adult thing to do. It did not seem blind trust to accept the advice of a well intentioned person who was operating fully within the standard parameters of an esteemed medical system. Completely logical, completely sensible, completely limited. 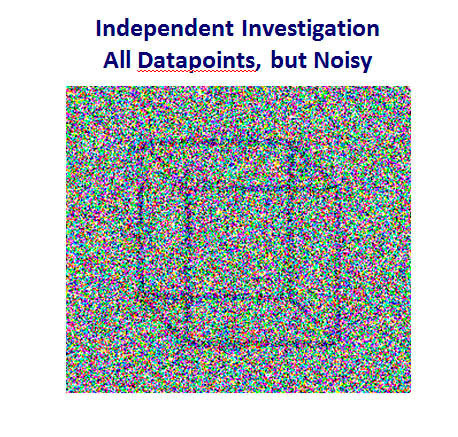 There are many examples of built in belief systems that seem eminently rational, that seem to have enough evidence to convince the experts in each field; but I have found it very empowering to remind myself that any dictate from authority is still based on incomplete data. "Reduce carbon emissions," "Avoid the sun," "After the big bang …" So many built in assumptions. A theory is only as good as it can be tested and produce useful results. (And some results take a long time to be revealed.) Looking back 50 years, doctors were promoting cigarettes. Paradigms can change. Even the ones your life depends on. Nothing hides the truth like a plausible explanation. I threw together a silly little example to show how even a well intentioned system can run amuck. The way I see it: scientists test a hypothesis, report results. These results are analyzed by an official committee who reports on the best hypothesis from the available evidence. This thesis is then reported to the rest of population. Rational people are then supposed to act on this thesis. This idea has several problems. In my example, the blue lines are supposed to represent the results from all the latest and greatest scientific studies. 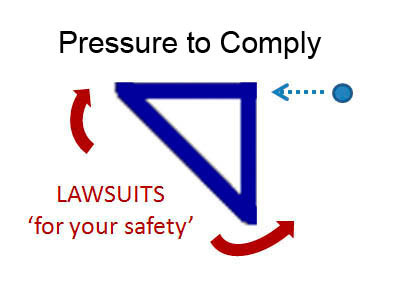 A governing body might look at the results and declare it looks like a blue triangle; the universe is a blue triangle; and any approved standard of care falls within this paradigm. Eminently sensible. Just look at the data! How dare anyone presume to question it? Well, the issue isn't so much the data. Each study reveals as much as its input conditions. The issue is with drawing a conclusion from an inadequate sample size. The focus is too limited. I can see how this can happen even in the best of circumstances. Scientific studies need funding. This funding usually comes either from industry or academia. Academia funding comes from review panels. Review panels need plausible cause in order to allocate resources effectively. I suspect this causes most studies, even in the best sense, to be incremental proposals vs the currently accepted datapoints. This will tend toward incremental results that cluster around pre-existing paradigms. Current theories about the nature of the universe are based on 4% visibility. I am not kidding. I would not call that an adequate sample size for a high probability theory. You can call it a 4% theory, stated in the context of extreme humility, not declare the universe is 96% dark matter and maintain the existing paradigms. I think it is increasingly unusual to fund studies that are outside of the box, so to speak. 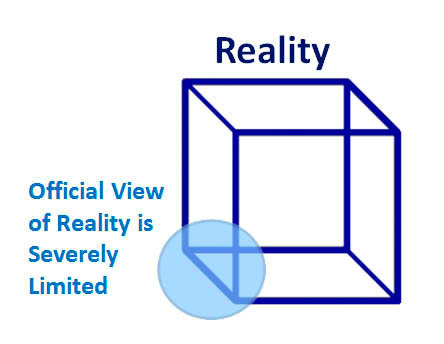 In my little example, the universe actually looked like this second figure: a cube. Studying one small corner alone would drastically skew your perception of reality, which in turn skews your 'rational' options. 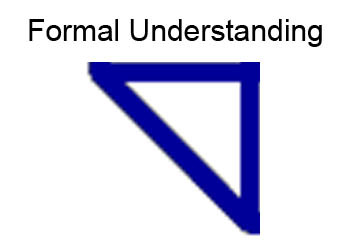 And in my example, the proper interpretation of the data isn't even really to call the universe a triangle ( not even the right number of dimensions); it is a limited perspective based on limited data. In my experience: Test it yourself! Or find other people who are testing ideas you find compelling as a closer starting point. The goal is not to re-invent the wheel, but find the point where you suspect something has gone terribly wrong and start investigating. I view it like being a detective instead of waiting to hear a verdict from a judge. Not all the suspects a detective interviews will have anything to do with the final verdict. Doesn't mean the lead wasn't worth checking. Your judgment is important. Going back to my little example, it's like suddenly opening yourself up to all kinds of noise. Apparently, this is what the authority figures are trying to shield us from. Yes, I suppose it is not as pretty and sanitized as the official version of available options. But at this point, finding patterns in noise is much more interesting and rewarding to me than picking the lesser of two evils, if those were your options. A significant danger of leaving it to authority systems to provide your sanitized available options, is that valid, but as yet unformalized truths will fall outside the approved 'standard of care'. I symbolize this by a point on my example cube of the universe that is not yet part of the approved 'triangle'. Even though you may have figured out an optimal solution for your situation, doctors (or other trained professionals) can be sued for recommending anything other than the approved 'standard of care.' You may be discouraged (or even forced) away from your optimal solution to conform to the approved procedures. Scary territory. I think they key is to keep a proper perspective. Know where experts or authorities are coming from; there is a limited set of options legally imposed on authority figures even if they are honestly intending to look out for our best interest. (Needless to say, conflicts of interest, ignorance, or downright fraud would make this much worse.) Just know the context of the information you are getting so you have a chance to optimize it for yourself. Engineers have a common expression: Garbage In, Garbage Out. We use tools to help automate common or complicated tasks, but those tools are only as useful as their input parameters. If you setup the test wrong, you will misinterpret the results. You could put together a whole flashy presentation with spreadsheets and trendlines and conclusions … all useless, maybe even harmful. So, when I hear there is some study supporting the latest drama on the news, I can't in good conscience as a rational human being accept that study as proof of anything. Context is everything. I would have to investigate whether the study setup was at all related to my own situation. The Mythbusters Discovery series show in depth how they setup their experiments, and then declare a myth busted or confirmed at the end of the show. It is probably one of the most visible insights the public sees into a scientific process. Despite (or as a result of) the transparency of the Mythbuster's studies, they are inundated with comments and feedback about problems or oversights with their test. Some shows are even dedicated to revisiting myths with tighter parameters or a new angle. Wonderful process! Even though the myths may seem relatively silly compared to the headlines splashed across the news, their willingness to engage the public in the process sparks creativity, ingenuity, and insight into the natural world. When 'studies' declare results on the news, they are essentially 'busting' or 'confirming' a myth (or hypothesis). Yet, the conclusions are presented as fact (usually with high drama and intense music), and experts in the field all to often end up supporting dogmatic assertions. It shuts down creativity, engagement, and rational thought. How the studies were conducted is barely mentioned, if at all. Imagine the faults people would find if they knew a fraction of how a study was set up! And yet, the implication is that people should change their lives as a result of the 'proof' from these studies. Creativity is needed! Humility is needed! Despite all presumptions, no one has figured this thing out yet. But that isn't intimidating, it is utterly liberating. If you find your selection of options ranges from bad to worse, question the source of those options. You may be supporting someone else's limiting beliefs. I suspect we have only begun to explore the possibilities available to us. Posted by Laura A Knauth at Saturday, March 09, 2013 No comments so far. Comments Welcome! If I will be using it for brushing my teeth or in a bath, I prefer to use organic baking soda to be on the safe side, but for most other general cleaning (since I use so much more of it), I have been buying big bags of this from Costco. Baking soda is abrasive, so I use it for tough kitchen-related stains (even for grout). I even used it successfully to clean an enamel dutch oven that got really stained, but do be careful if you have a fine polished finish. It doesn't seem like baking soda would be abrasive just to feel it, but it definitely has a super-fine scrubbing action. I've been very happy replacing whatever is in the commercial liquid detergents with a type of berry (of all things) from a 'soapnut' tree: http://en.wikipedia.org/wiki/Soapnut. Basically, you put a few of these berries in a little cloth sack & toss it in your laundry. Reuse a couple of times & then replace with fresh berries. If I need extra cleaning action, I put in a 1/2 cup or so of baking soda in with the clothes. If I catch the rinse cycle as it is filling up, I put in 1/2 cup of white vinegar. (I don't notice any vinegar smell afterwards.) This is also really good if you have left clothes in the washing machine too long & forgot to put them in the dryer. Just in case there might be any mold that had started to develop, I've rewashed the clothes with vinegar (I sometimes pre-soak them in pure vinegar) and they've come out refreshed & clean for me. I buy gallons and gallons of vinegar from Costco. There are so many uses for this stuff! To help with cleaning the carpets while I vacuum, I periodically dust the carpets first with baking soda. Other days, I might first spray some white vinegar on the carpets (it doesn't stain any of my surfaces, and I don't smell any vinegar after I'm done vacuuming, but do your own checking to be sure). It seems to help freshen things up for me anyway, so thought I'd pass it along. I have stopped buying most pre-packaged cleaning products & found I could replace almost everything more cheaply and what I think is significantly higher quality by finding individual bulk ingredients. (I'm still looking for a good dish washing detergent. For hand-washing dishes, I've been using Dr Bronner's Castile Classic Peppermint Liquid Soap, until I find a better option.) For me, single ingredient products fit in much better with my overall health strategy which is a very skeptical approach to processing. In the case of the 'behind-closed-doors' processing that occurs in factories, there is just too much pressure for high profits, and most of the cost-cutting measures that I suspect negatively impact health are not on the mainstream radar. If there's no adequate feedback mechanism, I see no choice but for companies to continue squeezing profits at the expense of consumer health until more people catch on. If the factors that I find are significant to optimal long-term health are not part of a company's business model, I choose instead to skip all of that processing, and instead buy the highest quality individual ingredients I can find. It's an investment in my health that is also cheaper! Posted by Laura A Knauth at Friday, March 01, 2013 No comments so far. Comments Welcome!